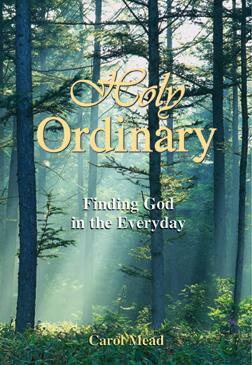 Holy Ordinary is a devotional book offering daily meditations on finding messages about God in everyday places and circumstances. The book is 400 pages, 5x7 inches, paperbound. To order the book, send a check for $14.95 per book to Carol Mead, 145 Pinevale St, Flowood, MS 39232. If you order five books or more, the price is $12.00 per book. Shipping is free on Holy Ordinary books. The second devotional book, Practically Holy, is now out of print and unavailable.